[ACT](RC):[Soul Blast (1)] If you have an «Oracle Think Tank» vanguard, draw a card, and put this unit on the top of your deck. ...a pretty simple effect that's only really for the Magus sub-clan. Briolette Magus has 9,000 Power, which is always good, with a rear-guard only effect, which is kind of a bummer but for good reason. During your main phase, you're allowed to Soul Blast 1 to draw a card and put this card on the top of your deck. This all but assures that you will guess correctly with Crescent, Stellar and Pentagonal Magus and will either give nice power bonuses in Crescent and Pentagonal or a nice hand maintainence with Stellar. One thing that I will mention is that if you're in a dire situation where you need Triggers more than a guaranteed prediction and don't have a Stellar Magus to add this back to the hand before the Vanguard attack, then DO NOT use this effect until you are sure that you can afford the guaranteed fact that your first Drive Check will not be a Trigger. Another nice combo with this, ironically, is with Battle Sister, Cocoa. Why? It's simple really. First, use Briolette Magus' ability to draw a card and place this on top of the deck. Afterwards, call Cocoa and use her ability to peek at the top card of your deck. Obviously, it's going to be Briolette Magus, and you can use Cocoa's effect to put Briolette Magus to the bottom of the deck and have her out of the way to make a better chance of pulling off more than one Trigger. 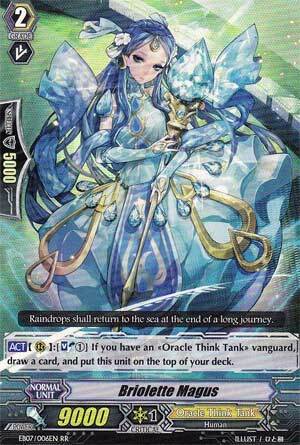 Overall, Briolette is a pretty solid card, but I wouldn't go overboard with using her effect, so use her wisely. Wrapping this week up is the bouncy castle of OTT, Briolette Magus. By soulblasting 2, you draw a card, then she goes from the rear-guard to the top of the deck. As a concept, I like her, but I don't know where she could reasonably go. The obvious answer is a Magus deck, but I can't recommend it owing to the Magus deck as a whole doing CEO's trick slower or worse. And if you intend to abuse the Stellar/CEO combo I talked about yesterday, then where's the room? Stellar takes up room, Silent Tom takes up room (and thanks to the fact we have Crescent Magus to couple with Tom for 16k+ columns there's no excuse not to run him now), and Susanoo takes up the rest of it. Outside of that, as a tech, I suppose she can add another condition to activate Stellar, but I wouldn't count on it. She's neat as an idea, but I'd wait until the Magus deck as a whole stops sucking so hard and she can fit snugly in.